I was a great reader of fairy tales. 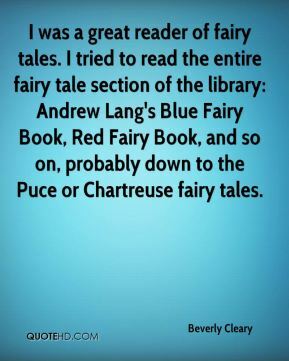 I tried to read the entire fairy tale section of the library: Andrew Lang's Blue Fairy Book, Red Fairy Book, and so on, probably down to the Puce or Chartreuse fairy tales. 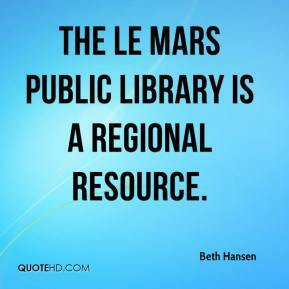 The Le Mars Public library is a regional resource. 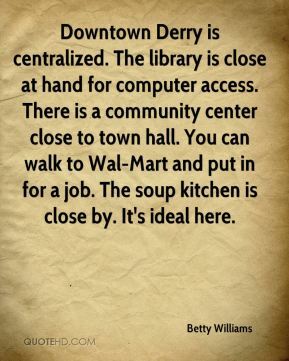 Downtown Derry is centralized. 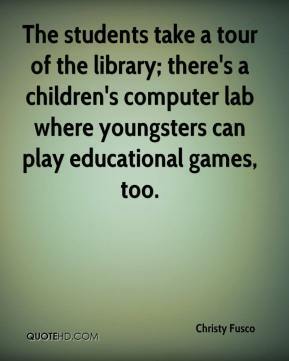 The library is close at hand for computer access. There is a community center close to town hall. You can walk to Wal-Mart and put in for a job. The soup kitchen is close by. It's ideal here. 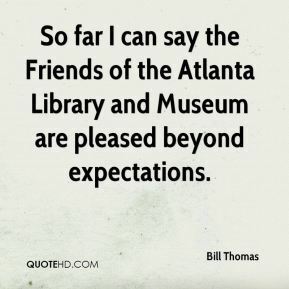 So far I can say the Friends of the Atlanta Library and Museum are pleased beyond expectations. 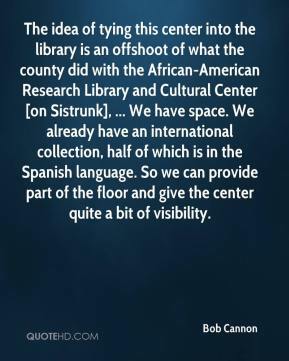 The idea of tying this center into the library is an offshoot of what the county did with the African-American Research Library and Cultural Center [on Sistrunk], ... We have space. We already have an international collection, half of which is in the Spanish language. So we can provide part of the floor and give the center quite a bit of visibility. 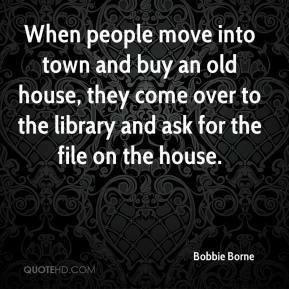 When people move into town and buy an old house, they come over to the library and ask for the file on the house. 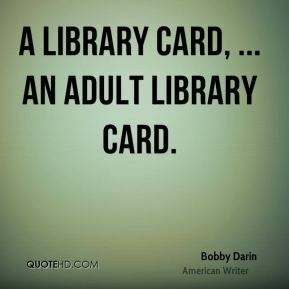 A library card, ... An adult library card. 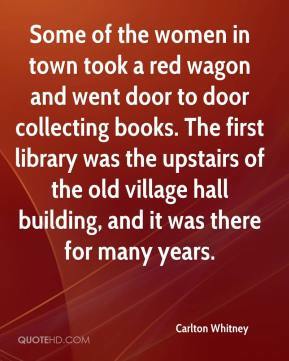 Some of the women in town took a red wagon and went door to door collecting books. 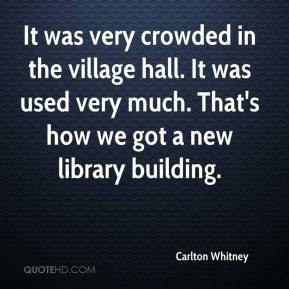 The first library was the upstairs of the old village hall building, and it was there for many years. It was very crowded in the village hall. It was used very much. That's how we got a new library building. 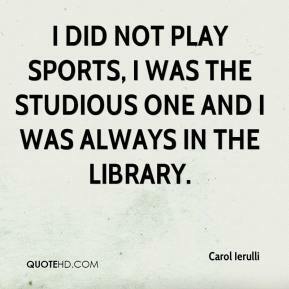 I did not play sports, I was the studious one and I was always in the library. 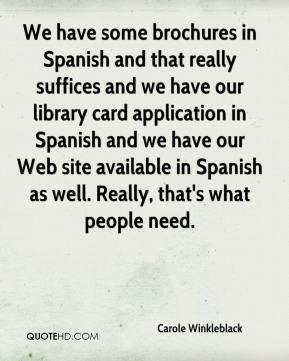 We have some brochures in Spanish and that really suffices and we have our library card application in Spanish and we have our Web site available in Spanish as well. Really, that's what people need. We have a really excellent collection. 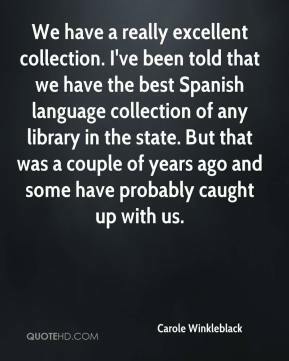 I've been told that we have the best Spanish language collection of any library in the state. But that was a couple of years ago and some have probably caught up with us. 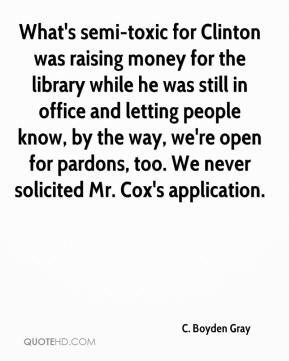 County library? 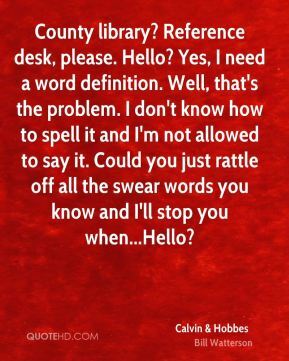 Reference desk, please. Hello? Yes, I need a word definition. Well, that's the problem. I don't know how to spell it and I'm not allowed to say it. Could you just rattle off all the swear words you know and I'll stop you when...Hello? 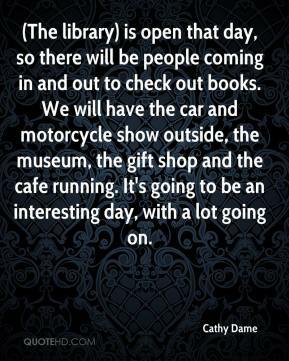 (The library) is open that day, so there will be people coming in and out to check out books. We will have the car and motorcycle show outside, the museum, the gift shop and the cafe running. It's going to be an interesting day, with a lot going on. 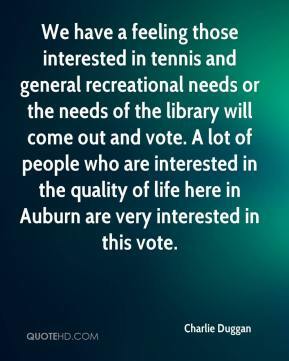 We have a feeling those interested in tennis and general recreational needs or the needs of the library will come out and vote. A lot of people who are interested in the quality of life here in Auburn are very interested in this vote. There were a band of misfits. They didn't set out to conquer the world or get in the Library of Congress. They were surprised by their success. 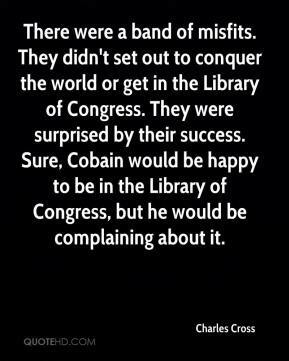 Sure, Cobain would be happy to be in the Library of Congress, but he would be complaining about it. 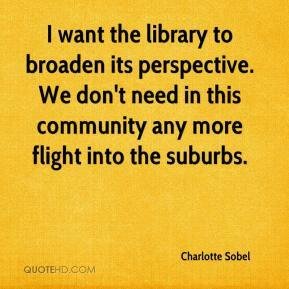 I want the library to broaden its perspective. We don't need in this community any more flight into the suburbs. We're going to do it like a lending library. 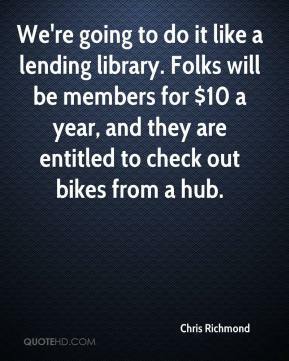 Folks will be members for $10 a year, and they are entitled to check out bikes from a hub. 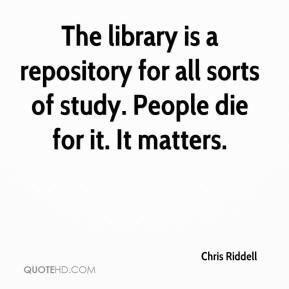 The library is a repository for all sorts of study. People die for it. It matters. 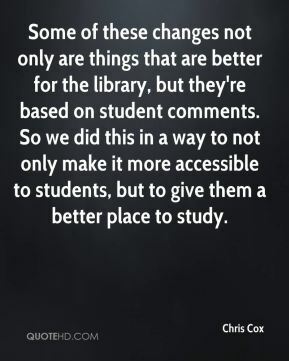 Some of these changes not only are things that are better for the library, but they're based on student comments. So we did this in a way to not only make it more accessible to students, but to give them a better place to study. 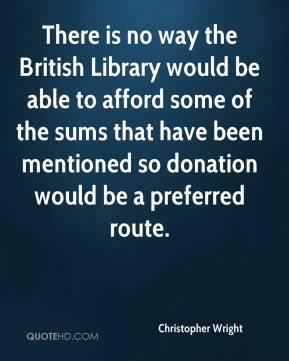 There is no way the British Library would be able to afford some of the sums that have been mentioned so donation would be a preferred route. This is our biggest fundraiser of the year. 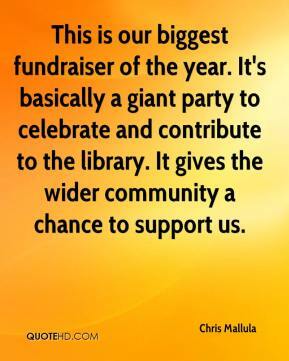 It's basically a giant party to celebrate and contribute to the library. It gives the wider community a chance to support us. Nobody's taught me. 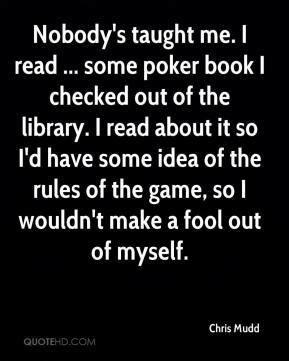 I read ... some poker book I checked out of the library. I read about it so I'd have some idea of the rules of the game, so I wouldn't make a fool out of myself.